First of all, I must blatantly admit that I have been extremely tardy in posting this – my final thoughts on an amazing Chazen trip to India. I could blame it on my simple procrastination (in fact, that’s partially accurate). Or the culprit could be the MBA lifestyle (after I landed at La Guardia, I got home and slept for 12 hours, cleaned my apartment, and started a block week course which left me no relaxation time between traveling and the regular semester start). But the biggest reason that I am just now writing this a month to the day from my return is that I have not felt up to the task of putting into words what an enormous perspective-altering experience the journey was. There is so much I could write, but nothing would do it justice. 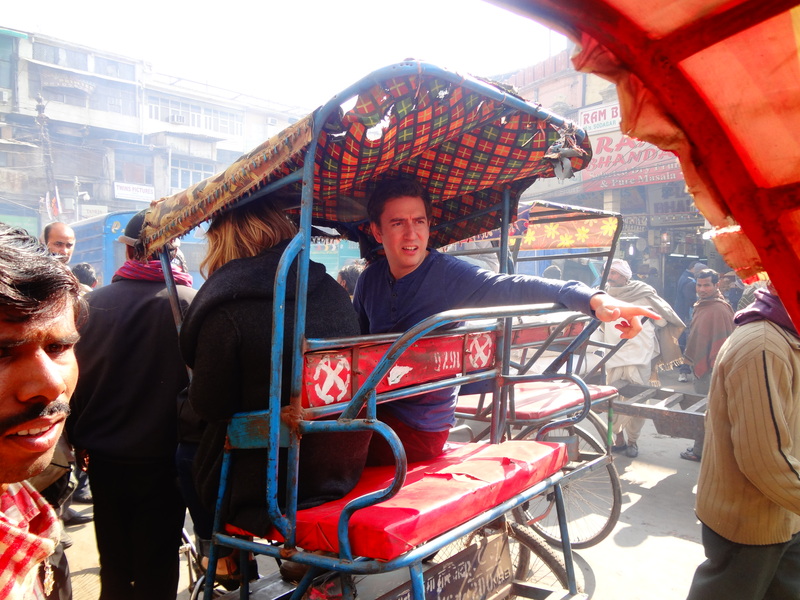 Marcos Sheeran, ’13, on break from a fast-speed rickshaw ride through an Old Delhi market. From a relationship standpoint, I now have 40 new people to whom I can say, “Hey, remember that time we felt lost speeding via rickshaw through a crowded New Delhi market? !” We share a common memory – a life moment – which bonds us together. (Or at least gives us cause to add 40 more names to our birthday party/karaoke night/happy hour guest list.) In fact, our private trip Facebook group is still going strong. The last post was made 13 hours ago, and it was about a recent CNN interview with Mukesh Ambani – owner of the billion-dollar high rise. Other posts that have gotten the group debating include one about the plight of women’s rights in India. While we were there, the domestic and international news story was the account of “India’s Braveheart,” a prominent victim of the recent gang rapes that have taken place in the country. Because most of our meetings were corporate in nature, there was little opportunity to discuss with any native leaders their thoughts on what the government should do about crimes against women, girl education, or the like. However, as we met confident, intelligent women in professional settings, we did sometimes wonder aloud how half of the country’s population must feel about policies and some widely held beliefs toward their gender. And while I cannot fairly hold cultural norms there to the standard of my Western sensibilities (ex. one airport security line for women versus six for men – annoying! ), I will say that I hope the inquisitive young girls that we met at Teach for India grow up in a society where they are wholly valued. Another post that sparked an even greater debate was one on how India’s economy is growing relative to China’s. One of our trip leaders sent us a related article from The Hindu newspaper, which gave thorough insight into middle-class preoccupation with GDP growth. Additionally, I have kept in contact with an Indian Columbia College alum who, in December, pledged to donate $12.12 million to the university for research and fellowships with a focus on India and other emerging markets. I “met” Sharik Currimbhoy (@SharikC), founder of a private equity and real estate firm, by Tweeting about his plan to leverage his relationship with the school for India’s eventual gain on the second day of our trip. He was kind enough to attend one of our alumni events thereafter, and spoke with me about how he plans to positively impact his homeland. Everyone, it seems, is doing his or her part to make sure that the rising tide of economic opportunity carries all ships. Still, quality of life disparity is stark – which was a huge takeaway for me, which then made me reflect on America’s own inequalities. I do not think that I will ever forget the palatial sight of the presidential – Maharaja – suite at Fortis Memorial (Hospital) Research Institute. We were not told the daily room rate, nor were we allowed to take photos. We were, however, given a tour replete with luxurious amenities for patients to enjoy, while literally across the street malnourished women begged for money as they held babies on their hips. Healthcare in India is a topic that I still want to learn more about. 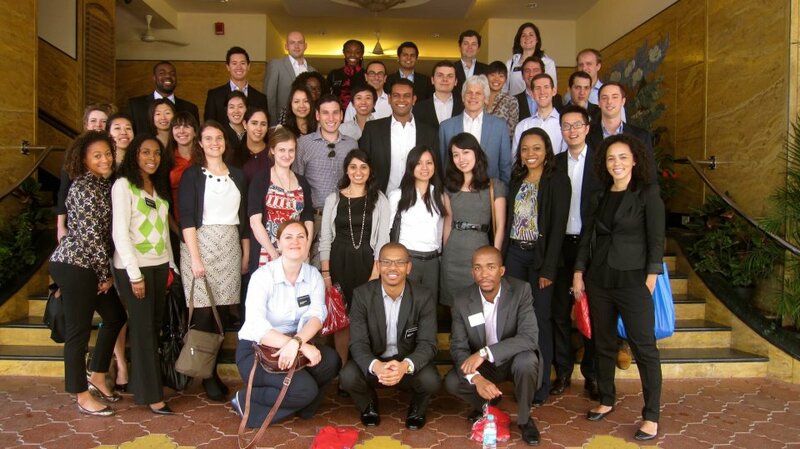 Chazen India participants pose outside of Kotak Bank in Mumbai. 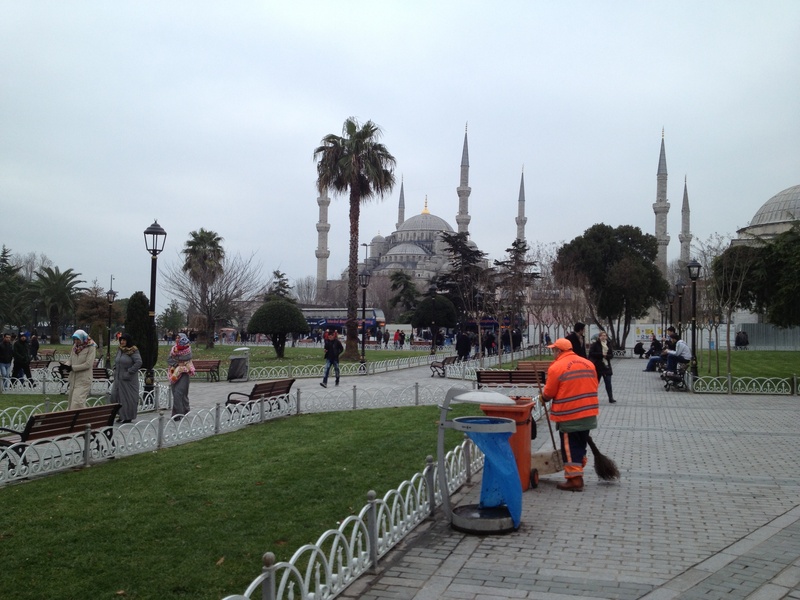 On a lighter note though, me and many of my fellow trip goers are still suffering from cultural withdrawal! Last week I was having a bad morning and the only thing I knew would cheer me up before class was a hot cup of chai. It has now become a staple in my diet, and even my Western sensibilities cannot comprehend why American business meetings do not standardly include tea with crisp, sugary cookies. Other trip participants agree; we may start a movement. Additionally, one traveler has taken to carrying a small Ganesh statue in her purse for wisdom and good luck, while another reported that his hand-woven rug from Jaipur is decidedly the best purchase he has made in a long time. We have not scheduled a trip reunion date yet, but I am sure we will all meet again (for Indian food, of course) sometime in the near future. In conclusion, the sights, sounds, and spirits of India are now embedded in my long-term memory. I learned so much that is relevant to my MBA classroom experience, and it is now enriched by a bit of global context – which I needed. Thanks to the Chazen Institute staff, Vijay Subramanian (MBA, 2013), and Alok Desai (MBA, 2013) for organizing a logistically complex trip! Getting such a high-level and diverse view of the country’s current situation would have been nearly impossible without their leadership.